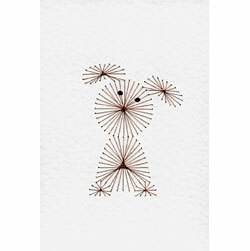 A free puppy pattern has been added at the Stitching Cards website. Children of 10+ should be able to stitch this (with some adult help and supervision). It is also a cute card for children to receive. The design has been kept delibrately simple with wider spaced holes and more detailed stitching instructions. This should make it quick and easy to stitch.